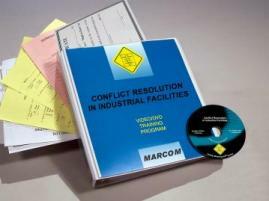 'MARCOM's "Conflict Resolution in Industrial Facilities" Video Program discusses the techniques and strategies that can be used to limit the damage and disruption conflict can sometimes cause in the workplace. Conflict in the workplace is inevitable. Anytime two or more people come together, they will eventually disagree about something. While some conflict can be healthy, it is often an indication that there is something wrong. The good news about conflict is that it is usually based on "caring". The more someone defends their point of view in an argument, the more they care. But if conflict is allowed to fester and grow without a resolution, it can lead to serious problems such as threats and even physical violence. This video shows employees that when difficult situations are dealt with in a calm and unemotional way, compromise and collaboration are possible... and a lot can be gained from resolving a conflict. The video includes information on the consequences of conflict and how it can disrupt the workplace, how resolving workplace conflict is an integral part of everyone's job, common causes of workplace conflict and how to recognize them, diffusing disagreements before they get out of hand, the damage that escalating conflict and violence can do to an organization, how collaboration can be a valuable tool in resolving conflicts, how to apply proven conflict resolution techniques and strategies, and more. The video program comes with a comprehensive leader's guide, reproducible scheduling & attendance form, employee quiz, training certificate and training log.